This learned Doctor and apostolic man flourished in the second century. Born in Sicily, he was a Hebrew Christian who had studied Holy Scripture and also Greek philosophy. His esteem for virtue had led him into an acquaintance with the Christians, and being charmed with the innocence and sanctity of their conversation, he opened his eyes to the truth. It was under the disciples of the Apostles that he studied Holy Scripture in the orient, before his thirst for sacred learning brought him to Alexandria in Egypt, where the disciples of Saint Mark had instituted a celebrated school of Christian doctrine. Pantænus did not seek to display his talents in that center of literature and commerce; but his great progress in sacred learning was discovered, and he was drawn out of the obscurity in which his humility had sought to bury itself. He was placed at the head of the Christian school some time before the year 179. His learning and excellent manner of teaching raised the school's reputation above all schools of the philosophers, whom he strove to win to Christianity. The lessons which he read and commented, gathered from the prophets and Apostles, conveyed light and knowledge into the minds of all his hearers. The Indian traders who came to Alexandria entreated Saint Pantænus to pay their country a visit and vanquish false philosophy by the true faith. He was advised by the bishop of Alexandria to consent, and therefore left the school and went to preach the Gospel to the eastern nations. 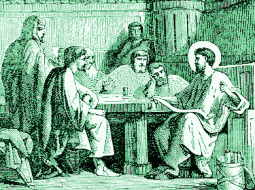 In India he found some seeds of the faith already sown, and there he was shown the Gospel of Saint Matthew in Hebrew, which according to Eusebius' account in his History of the Church, was taken there by Saint Bartholomew. He brought it back with him to Alexandria, where he returned after he had zealously employed several years in instructing the Indians in the faith. Saint Pantænus continued to teach privately until about the year 214, when he closed a noble and excellent life by a holy and happy death. Reflection: Take care that none lead you astray by a false philosophy, says Saint Paul, for philosophy without religion is a vain thing. Les Petits Bollandistes: Vies des Saints, by Msgr. Paul Guérin (Bloud et Barral: Paris, 1882), Vol. 8; Little Pictorial Lives of the Saints, a compilation based on Butler's Lives of the Saints, and other sources by John Gilmary Shea (Benziger Brothers: New York, 1894); The Catholic Encyclopedia, edited by C.G. Herbermann with numerous collaborators (Appleton Company: New York, 1908). The second commandment is like the first: Thou shalt love thy neighbor as thyself.